The 2019 models are showing up to dealerships near you and that means it is the perfect time for a new vehicle. There are plenty of new models to choose from, but you want to make sure that you find the one that is right for you. The all-new 2019 Volkswagen Jetta has been redesigned for a premium look and feel. Along with looking good, it also performs well. To show how the 2019 Jetta compares to others like it, we put it in a comparison with the 2019 Toyota Corolla. When we compared these two popular 2019 sedans, we found that the Jetta packs a bigger punch. Jetta drivers will have 147 horsepower while drivers that choose the Corolla will only have 132 horsepower. Not only does the 2019 Jetta provide more power, it also has a better fuel economy. Top that off with the best bumper-to-bumper warranty, and the 2019 Volkswagen Jetta is hard to beat. Continue reading to view the comparison and to learn more about the 2019 Jetta or click on the button below to view our current Jetta inventory. As we mentioned above, the 2019 Volkswagen Jetta went under a redesign. With this new redesign the exterior appearance of the sedan effortlessly makes a statement. The overall look is sportier and sleeker which makes it more appealing. Some design features that add to the look include the LED headlights with LED Daytime Running Lights (DRL), the LED taillights, the panoramic sunroof and much more. Inside the sedan, the two-tone V-Tex leatherette seats are the perfect mix of style and comfort for passengers. Available ventilated seats only add to the comfort that is provided. 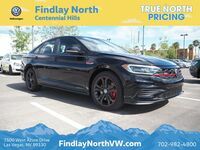 If you are a driver looking for a sleek and comfortable car that also performs well, then we suggest checking out the 2019 Jetta from Volkswagen. Click on the button below to receive more information!